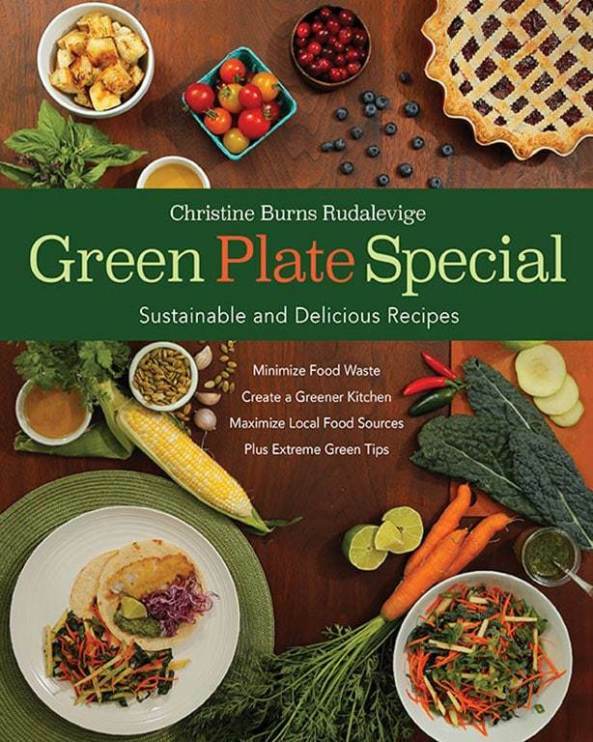 When I saw the cover of Green Plate Special – Sustainable and Delicious Recipes I felt a frisson of panic. I thought it was a school textbook; at least, it was giving a darn good impression of one. Textbooks have always had that effect on me, unless it’s about mathematics, in which case a mere pamphlet can make me faint. Apart from the dominant brown-green colour, the photo of mostly raw and not particularly appetizing food, and the conservative typeface, there were the bullets of information below the subtitle. Bullets like: Minimize Food Waste, Create a Greener Kitchen and Extreme Green Tips. (Each one looked like it should have ended with an exclamation point.) I opened the book prepared for 200 pages of earnest and preachy. Relief was what I felt once I got into the book. Yes, there’s a little that’s hard to swallow – none of the food, by the way – like author Christine Burns Rudalevige’s suggestion we buy loose tea instead of tea bags, for the sake of the planet. (Good luck with getting the world’s tea lovers to quit tea bags.) Most of the book’s green pronouncements are in essays, taken from the author’s column “Green Plate Special” for the Maine Sunday Telegram. They mildly punctuate the book and in fact make for mostly interesting reading. I found the information about “best by” dates and how they lead to unnecessary food waste to be fascinating, as well as why ground, pastured meat is the cheaper greener option. Burns Rudalevige’s explanation in Modern Meat Vocabulary of the difference between “certified humane” and “certified organic,” “grass-fed” and “pasture raised” is extremely useful. Taste is subjective but I didn’t see a single recipe in Green Plate Special that wouldn’t appeal to most people – well, maybe the kimchi ramen might give some folks pause. Otherwise, what’s not to like about: spicy crab and arugula omelet, lobster and corn wontons, mustardy pork schnitzel, and maple pecan cream tart? Burns Rudalevige has been a journalist for decades and was, for several years, a cooking instructor. In other words, she knows how to write a recipe that’s instructive and gets the job done. Each recipe gets the amount of explanation required and no more. Some, such as kimchi ramen, are brief. Others, like Spanish potato tortilla, are three times as long. A good result is what counts and, in both cases, Green Plate Special delivers. More shrift should have been given the images. They’re important, because so many of us look to the pictures for inspiration. While photos such as a full-page snap of lemon and herb spatchcock chicken and another of husk cherry and hot pepper upside-down cornbread look mouthwatering, others are downright disappointing. There’s no way, for example, I’d ever want to make kale rabe and potato tart based on the book’s image of the finished product. It looks like a bad Twitter pic from a too dark restaurant. There’s enough special in Green Plate Special – Sustainable and Delicious Recipes to recommend it, however. It’s a cookbook for its time, and contains information needed in every kitchen and by every cook today.